It all started in 1979,when Ernie and Eva Serrano were working in the family business, Serrano's Clothing Store, in downtown Chandler. The Serrano family had several clothing stores dating back to 1919, making Serrano's the oldest, continuous family owned business in Chandler. 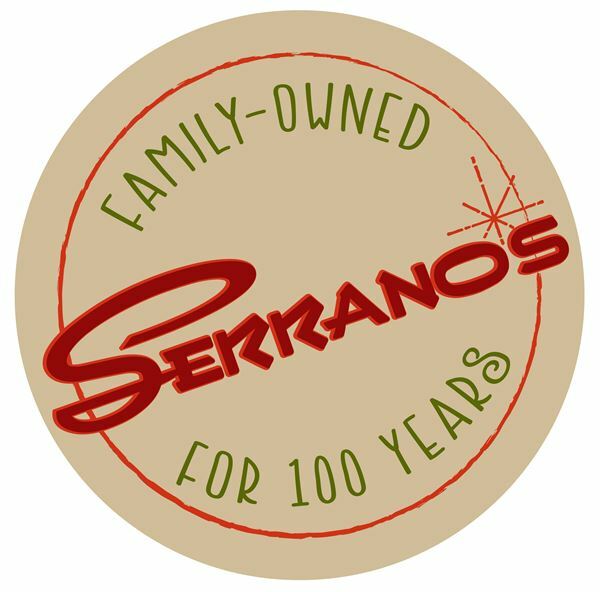 Using the same Serrano's logo as their clothing stores, Ernie and Eva opened their first restaurant in 1979 just behind the clothing store in downtown Chandler.Their efforts were prosperous, and a few years later their son, Ric, joined the Company and opened their second location in Tempe. Serrano family owns and operates 8 restaurants with 7 Mexican food locations in the Southeast area and Brunchie's, a breakfast and lunch restaurant in downtown Chandler. Serrano decided to open their first Mexican Food Restaurant in downtown Chandler. Dedication, hard work, and great food have allowed them to successfully open additional locations in the Southeast area and Phoenix. Today, Serrano’s Mexican Food Restaurants and Catering, remains family owned and operated. Serrano's is the perfect venue for your next event - small or large. Banquet facilities available for rental. Cost is reflective of a 3-hour minimum. There is an hourly rate for each additional hour after that. Includes tables, chairs, linens. Food is an additional purchase.